Facebook Traffic to Publishers? Up? Down? Huh? If you, like me, have been following the media sites lately, you will have noticed quite a lot of articles about how Facebook's recent changes have had an impact on reach. The problem is that the data we have is massively inconsistent, and the sources from which it is measured are almost always third party. But let me sum up what we have been hearing for the past couple of months. First, we have a study from Parse.ly that claims that publishers haven't experienced any drop in reach, but rather that it has increased. Parse.ly's network of sites includes more than 600 digital publishers, including many big names (Upworthy, Slate, The Daily Beast, Business Insider), so its experience is likely to be representative of news media more broadly. Meanwhile SocialFlow did a similar study, where they measured not just the overall traffic, but also the reach on a more granular level. Keep in mind, this study is from before Facebook's latest change (which some claim made it even worse). If we look at it overall, they report the same as Parse.ly, in that over the past couple of months, there has been no noticeable difference in overall reach. But then they also looked at Post Count, and found publishers have been posting more and more every month. In other words, the total volume of posts has gone up quite a bit. 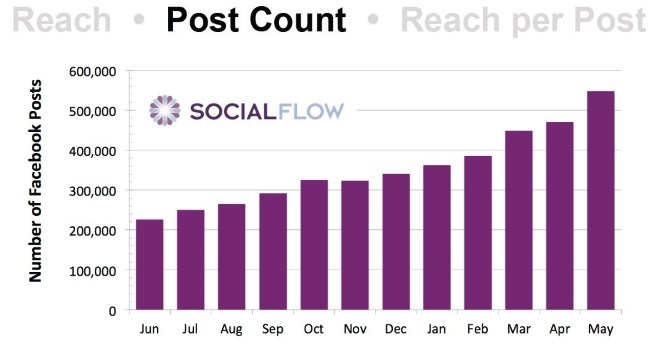 Obviously, if the volume goes up while the reach stays the same, the outcome must be a decline in reach per post. And this was exactly what SocialFlow found. 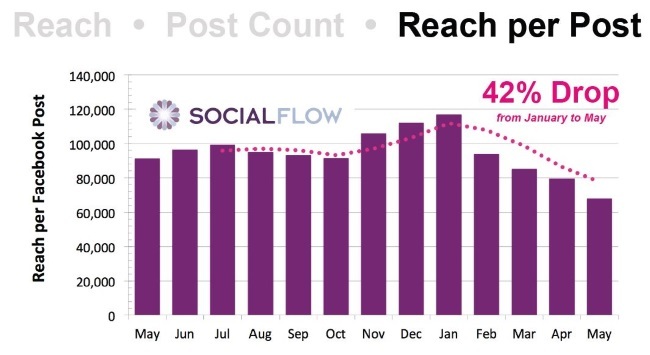 When you look at reach at a granular level, there has been a 42% decline in reach, which is a lot. Mind you, one could argue that this isn't really Facebook's fault, since it's not Facebook that is posting these. If we as publishers just all stopped focusing on 'scale for the sake of scale', we wouldn't have this problem. And while that is true, it also illustrates how Facebook works. 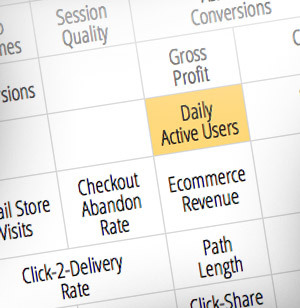 The way Facebook optimizes its engagement is like a supermarket. And every supermarket will optimize for the volume of goods rather than value of the individual product. I wrote more about this in "How a Growth in Social Engagement is Also a Drop in Reach and Loyalty" and also in my latest Plus article. This is something I have been talking about for more than a year, because the trend here is very clear. 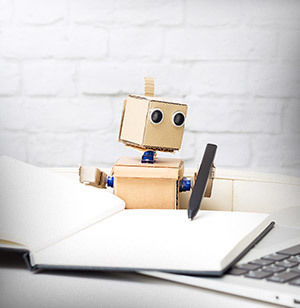 Social media - which was once a place where people chose to connect with us, and we used that connection to nurture our audiences - has become a place for random posts for people with very low-intent. Then we have a study from SimilarWeb. Every month they release their ranking: "U.S. Media Publishers and Publications - Ranked for July 2016", and here we see... well... it's a bit tricky. You will notice that the publishers who have experienced the smallest drop are also those commonly known for more snackable content, which matches what I have been seeing in other places. 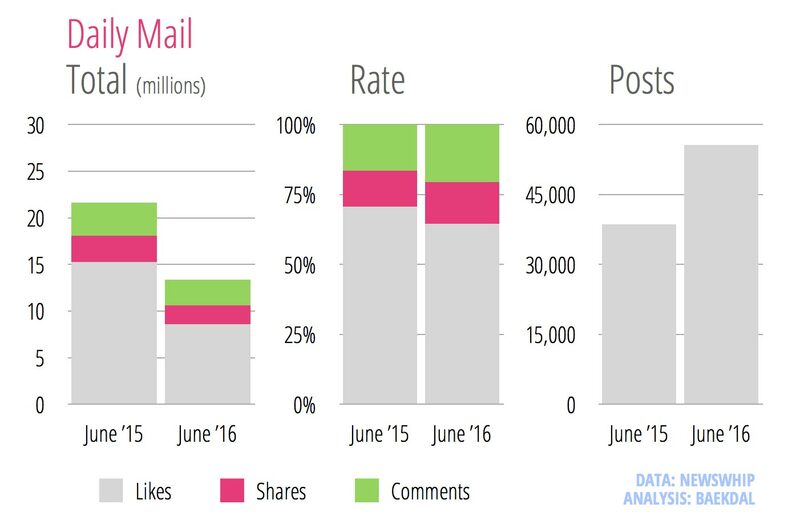 Facebook is increasingly only a relevant platform for a certain type of content. The problem with this study and SimilarWeb in general is that they are only measuring desktop traffic, and a 20% drop in desktop traffic over the past year might not have anything to do with Facebook. 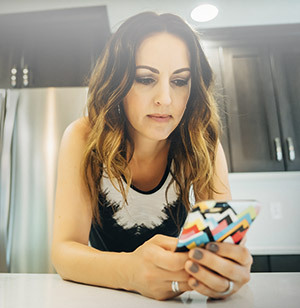 It might simply be caused by the increase in mobile, and especially people are increasingly using Facebook only via mobile. 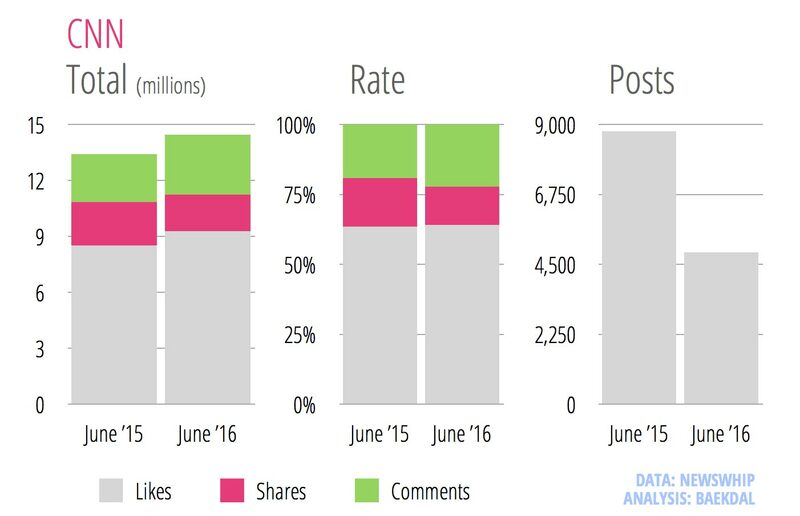 Over the past year, Facebook's mobile-only share of traffic has gone from 50% to about 62%. So SimilarWeb's study on Facebook reach might not mean anything. And if I only knew about these three studies, I would probably ignore SimilarWeb's data and just go with the 'total reach is flat, but reach per post is down by a lot'. The problem is that this is not what I am hearing from people in the industry. And I have been hearing this from other publishers as well. So, you see the problem? The data that we have is not very consistent. But looking at reach isn't the only way to look at Facebook. We can also look at engagement. And the place we find the data for that is NewsWhip. 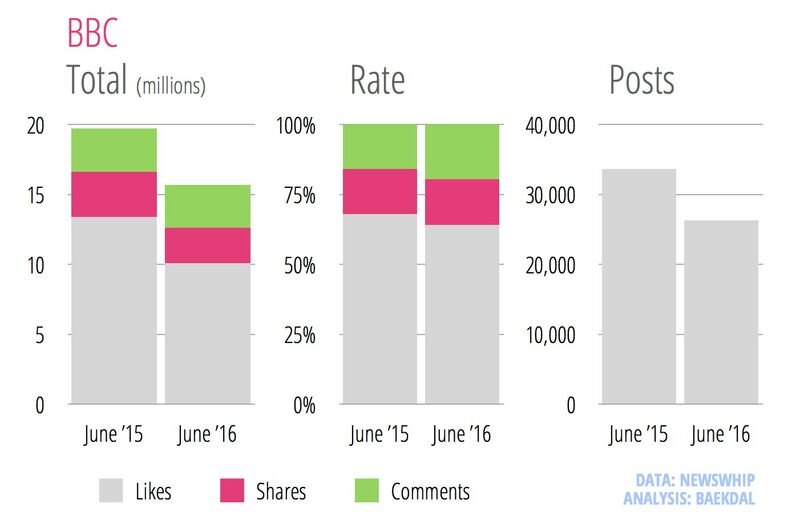 Almost every month, they compile a list of top publishers on Facebook in terms of likes, comments and shares. So, I ran the numbers. UPDATE: This section has been updated to clarify what 'number of articles' refer to. 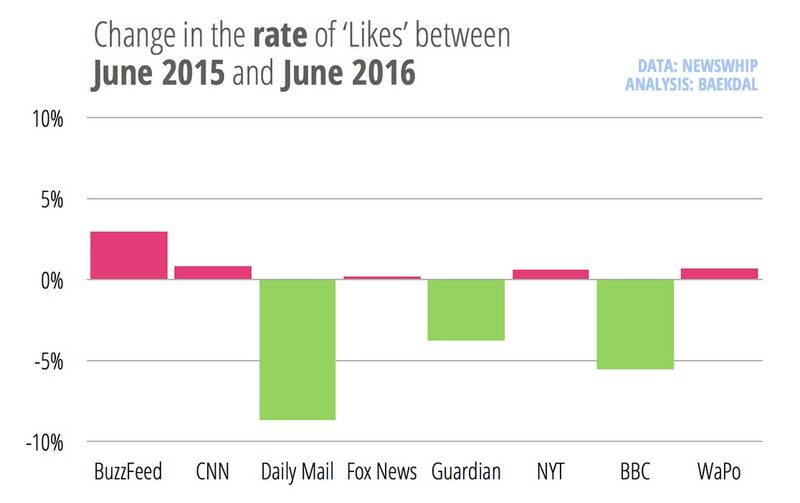 Apart from Huffington Post who has been on a bit of a rollercoaster ride, everyone else has seen a decline in engagement. 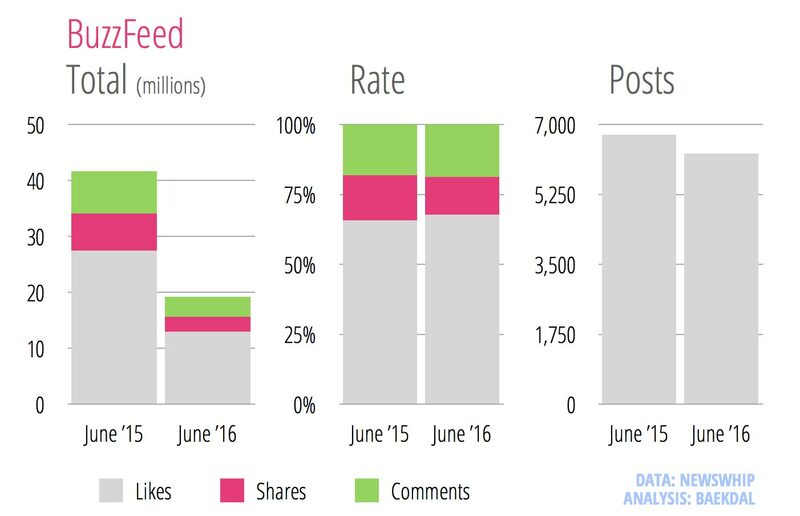 So it's not just reach that is in decline, it's also the number of times people like, comment and share each post. 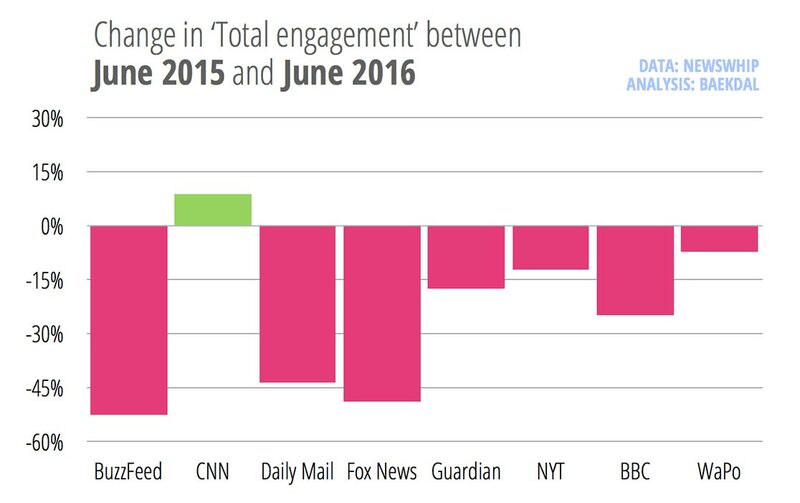 Again engagement is way down across the board (with the exception of Huffington Post). We can also look at this on a per post level. First of all, the top publishers post a silly amount of articles every day. Fox News and Daily Mail post about 1800 posts every single day, while BuzzFeed, CNN and New York Times only post about 200. The 'Posts' or 'Article Count' number (or 'Number of Stories' here) refers to the number of articles with unique URLs produced by each site in a given month. Our system picks up these stories once they appear on the publisher's site, and they don't even ever have to be shared on social media for our system to record them. They include wire copy and RSS posts from publishers, which push up the total count for many sites. For other network sites like Fox and NBC, we count all articles from their regional affiliates too. 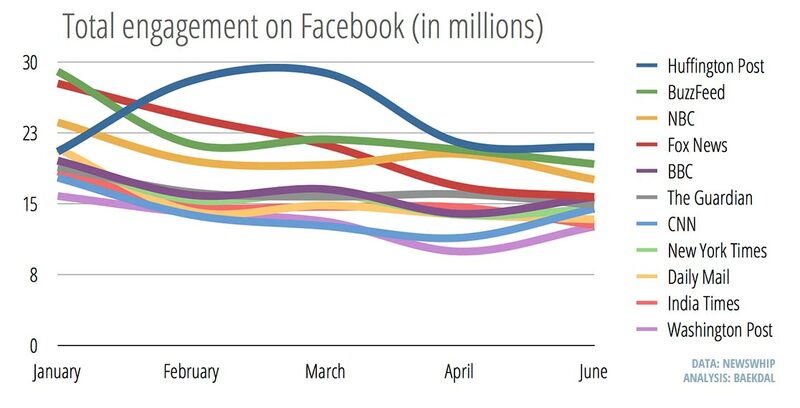 In other words, this data represents all Facebook interactions for every article the publisher published on their site(s) in any given month. The result looks like this. What's interesting here, though, is that it doesn't really show any big increase or decline in the number of posts over time. This is contrary to what SocialFlow found when they did the same study (albeit across a much wider range of publishers and only on Facebook). 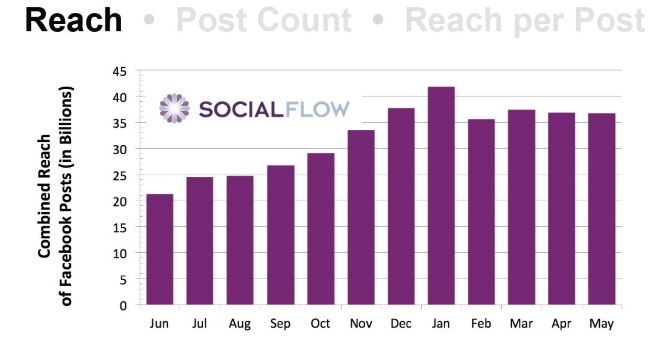 Remember, SocialFlow found that there has been about a 50% increase in the volume of posts overall. The possible answer to this may be that publishers are now sharing a larger number of their posts on Facebook, or it might be caused by other factors. This graph is a bit hard to read because of how big a difference there is between publishers. 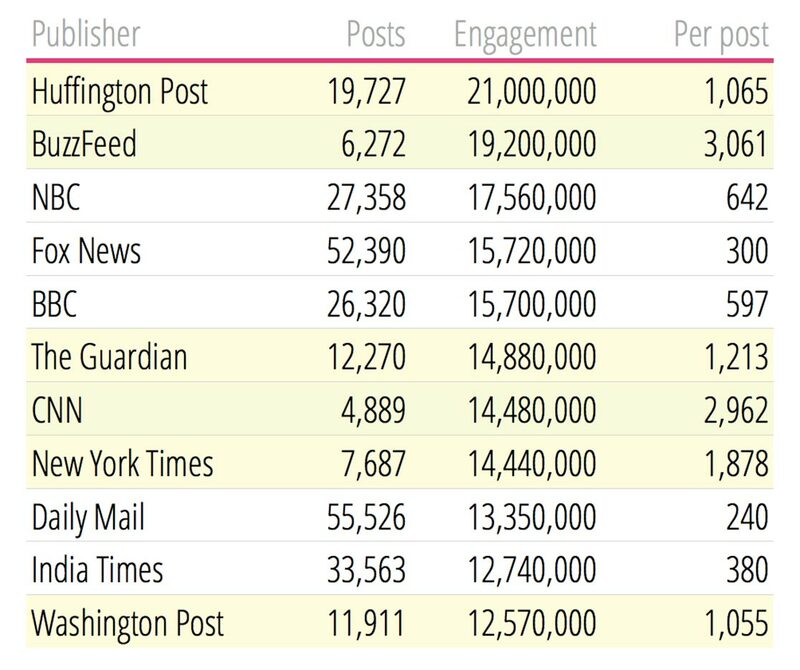 BuzzFeed and CNN both have about 3,000 engagements per posts, whereas Daily Mail and Fox News only have about 270 engagements per posts. That's a huge difference in terms of performance. What's interesting about this, though, is that the publishers who publish the most are also those who perform the worst on a per post level. 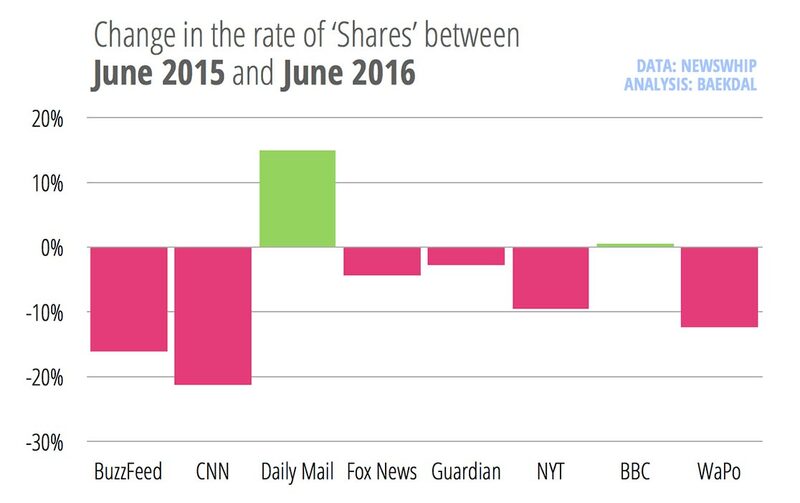 Compare Daily Mail and Fox News with BuzzFeed and CNN. Just look at how much better BuzzFeed is performing per post. BuzzFeed has 40% more engagement with 10 times fewer posts, and the same for CNN compared to Fox News. It's just a staggering difference. BTW: Here is the full list for June 2016. And as you can see, New York Times, Guardian and Washington Post are also doing fairly well on a per post level. Note: I was also considering doing this analysis by comparing these numbers to how many fans each publisher has, but the problem with doing that is that many of these publishers have more than one Facebook page... so it's tricky to do right. It's interesting to look at this overall, but we can get even closer yet. 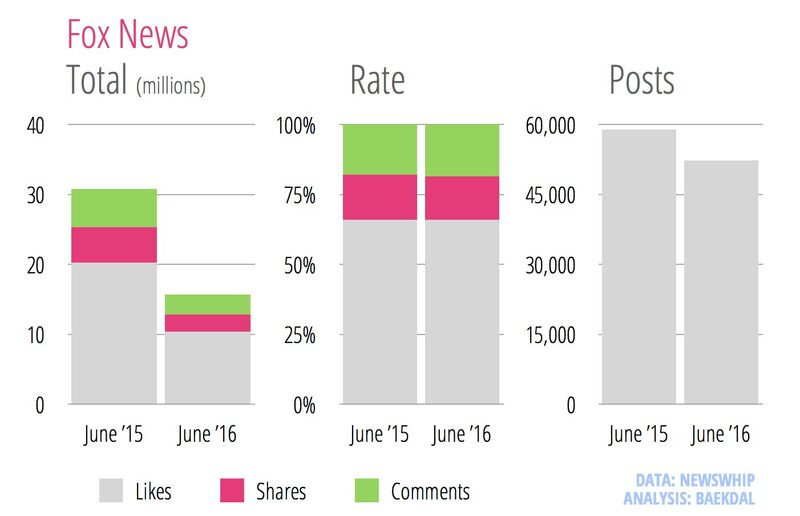 What if we instead looked at the type of engagement each of these publishers get, and then compared the latest data, which is from June 2016, with what it was a year previously (in June 2015)? Note: Keep in mind, we are only talking about engagement on Facebook here, because I don't have this data for reach and referrals. As you can see, Buzzfeed has experienced a rather dramatic decline in overall engagement. The changes to Facebook's News Feed has really not been kind to them. 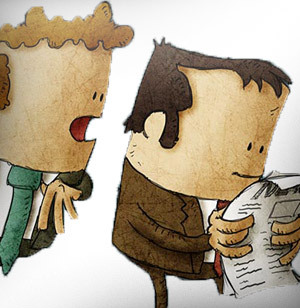 You will also notice that the type of engagement has become more shallow. 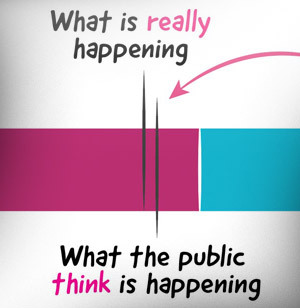 As we all know, it's much better to get people to share a post than to merely like it. Sharing is critical to our success, whereas liking is the shallowest form of engagement that we can have. Comments are nice too, especially in terms of ranking in the News Feed, but more comments don't really help publishers sell more exposure to advertisers. And, for BuzzFeed, sharing is down while likes are up... which is not a good sign. Fox News is also not doing so well. 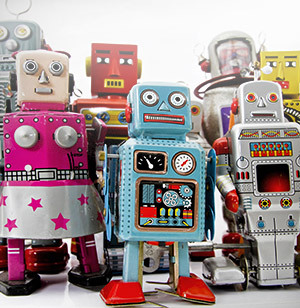 It too has seen a dramatic drop in engagement, but there is no real difference in the type of engagement. Notice also that both BuzzFeed and Fox News are now posting slightly fewer articles per month, which might come as a surprise to you. Again, keep in mind that this isn't the number of posts they publish on their Facebook page, but how many articles they have posted on their websites and then compared with how much overall Facebook engagement for each. 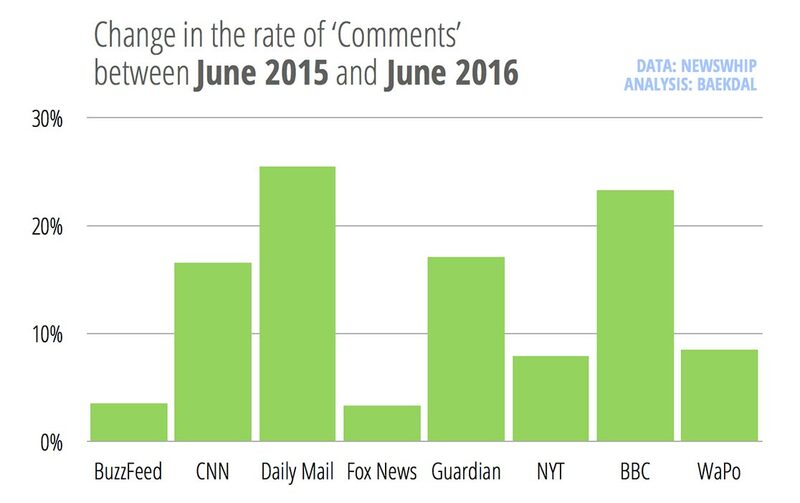 CNN, however, is doing somewhat better, as it has experienced an increase in engagement. But look at what has happened to sharing. It has dropped quite a bit, mostly being replaced by comments. When we look at the Daily Mail, however, things are a bit different. Here they are posting far more articles than a year ago while getting a much lower level of engagement. But they have managed to turn more of that engagement into a better form of engagement, since more of that remaining engagement is in the form of sharing and comments. 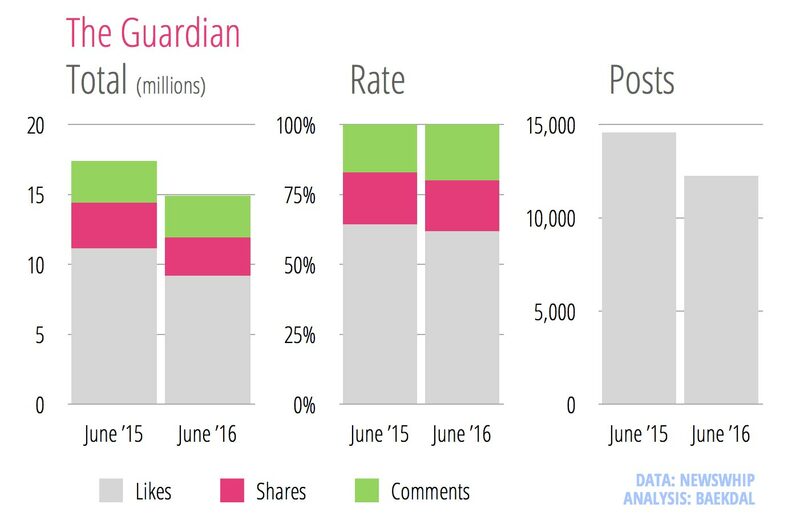 The Guardian too has experienced a drop in engagement, but like Daily Mail, they are now getting a higher rate of comments than before. And the BBC looks exactly the same. 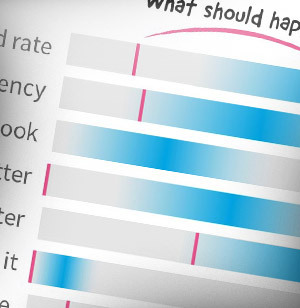 Less engagement overall, fewer articles, but with slightly higher rate of comments. 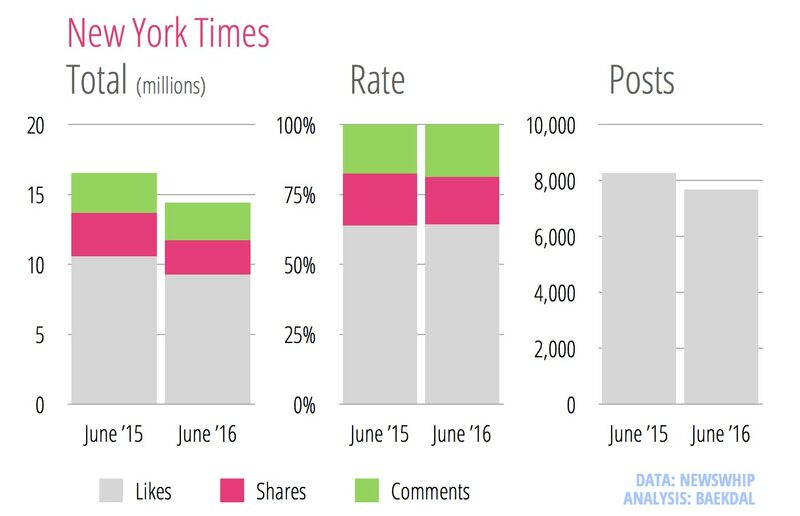 The New York Times has also experienced an overall drop in engagement and their rate of sharing is down (which is bad). But now let's look at the Washington Post. You might remember that over the past several months, many people have been talking about how amazingly they are now doing on Facebook. Well, not exactly. 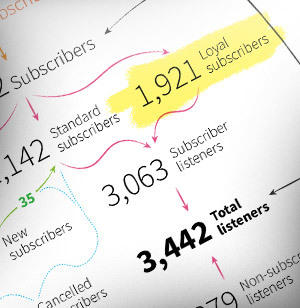 In terms of reach, as illustrated in the first section of this article, Washington Post's overall reach has dropped from 16 million to 13 million. And between June 2015 and June 2016, their engagement has dropped as well, especially sharing. 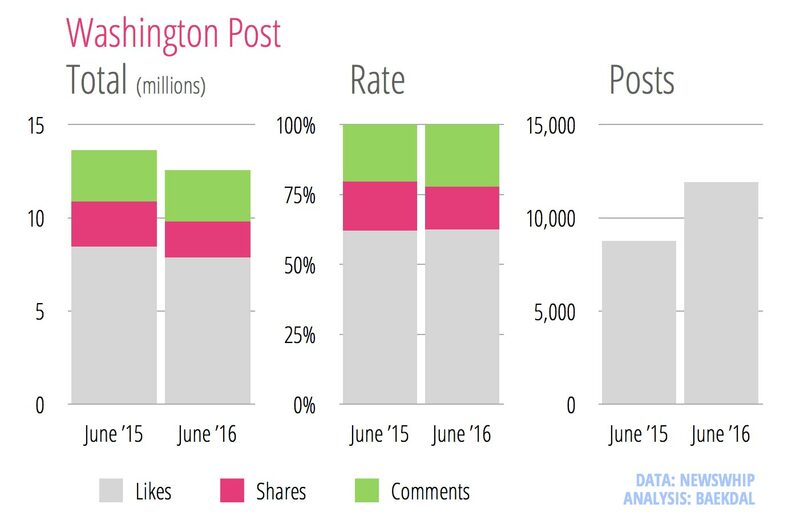 Washington Post has changed for the better since Jeff Bezos took over, but in the past year, they have been hurt by Facebook changes as much as the rest of the market has. Note: Remember that we want the rate of likes to go down, because this means that more of the engagement is either sharing or comments. This actually tells us a lot about what Facebook means when it says it is optimizing for engagement. As you can see, sharing posts is down across the board, but every single publisher has experienced an increase in comments (as a rate of the total engagement). In other words, Facebook is really optimizing for conversations. This also illustrates the disconnect that exists between publishers and Facebook. As publishers, we need sharing and reach to make any money, but Facebook needs conversations. It's this mismatch of priorities that is causing all this friction. But, of course, the real problem is that when we look at things overall, both the total reach (as illustrated in the first part of this article), and the total engagement are way down. So, overall, things look pretty bad. I will end this, however, on a slightly positive note. Because notice who is being hurt the most. 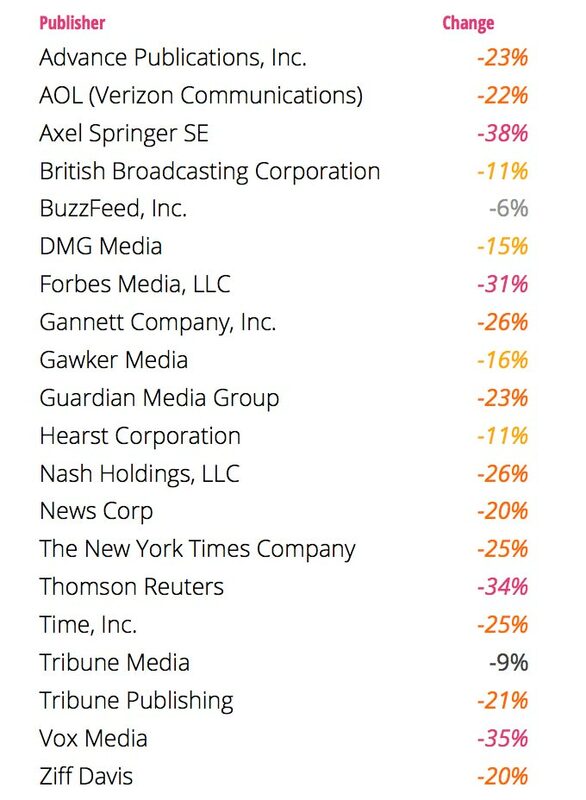 BuzzFeed, Daily Mail, Fox News are all hurt badly by the many changes to Facebook algorithms, while more 'journalistic' publishers like New York Times, The Guardian, and Washington Post are hurt the least (CNN is probably an outlier here). This is a wonderful trend to see for anyone who is worrying about the future of real journalism. While things are bad overall, the best journalism is not doing as badly as the worst journalism. It doesn't change the overall trend, nor does it solve the problem that Facebook is increasingly turning into a low-intent micro-channel. But, there is hope yet. Of course, this is only true for engagement. For reach it's the opposite.